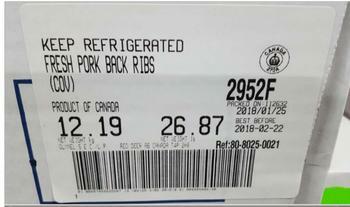 Olymel S.E.C./ L.P., of Alberta, Canada, is recalling approximately 4,618 pounds of raw intact pork products. The products were imported from Canada did not undergo federal inspection upon entry into the U.S.
30-lb. cases containing “WILLAMETTE VALLEY MEAT COMPANY PORK FEET WHOLE” with USDA EST. 21134 and pack date of 1/30/18. The recalled products were shipped to retail and restaurant locations in Oregon and Washington, and exported to a Department of Defense Commissary in Japan. Consumers with questions about the recall may contact Richard Vigneault at (514) 497-1385.